How did a Baptist kid from Gilmore Texas eventually become a Catholic priest? This is a delightful story full of instruction and apologetics. I love to share conversion stories to affirm our Catholic Faith. Such a story as this rings in our hearts and confirms that we are in the right place. It also gives us knowledge and insight to share the truth with others. 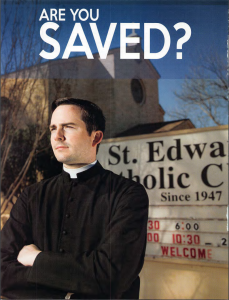 The title of the interview is “Are You Saved?” Coming from Texas, which is known as part of the Baptist Bible Belt, this is a timely and appropriate article. You can enjoy the who interview and moving story HERE.